The spring was a good one for the horses as we had more rain than usual and the grass grew reasonably well… for here. As a result we have made about half the hay that we need for the winter off the farm and surrounds, and even made some silage to help Oryx who suffers from a cough with dry feed. 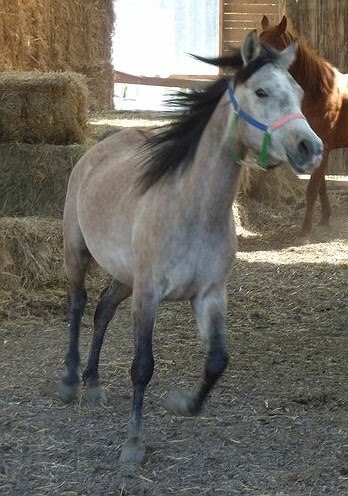 Marie Dussaux, who has a house in the village, contacted us about having Fanny a Barb x Arab mare that she had bred and handled when young, but had been untouched until now, 7 years. 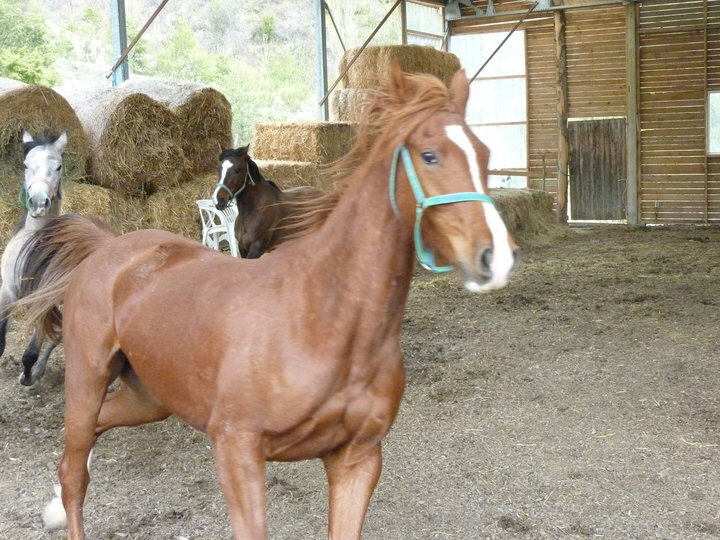 She wants to sell her, but needed her to be educated to be ridden before she was likely to find a buyer. We took her on and she is now a quiet, very pleasant ride although she needs more work before she would suit a complete novice. I thoroughly recommend her to anyone who will continue her education and wants a pleasant companion, friend and to do randonnes. 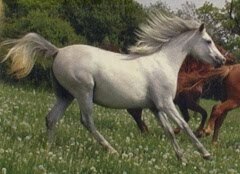 She is not expensive and could well breed a very nice foal, particularly with one of our stallions. We started endurance training in May with Shindi and Lilka, two mares, and had various teething problems with soft soles and sore feet, but these have now been put to right and the pair of them are seriously fit, coming first and second in the 60 k Alp d’Huez ride in the alps, up and down over 2,000m with recovery rates in the low 40’s, and Shimoni (who is for sale) also taking part with Jake who is now running his horse ethology and safari business (see Horseridingfrance.com, shortly to be translated into French). We have done a couple of other rides of 40k at 15k/hr and been placed with all horses in the first 3 so far this year, the last one was a ride across Ardeche which was delightful ending up at a Western Riding festival! 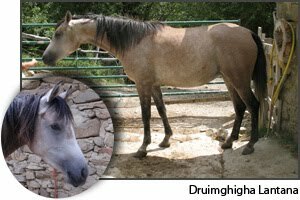 The high light this year so far with the horses has been a 5 day ride around the Vercors we took Shindi and Oberlix and then replaced Oberlix after 2 big days of over 40 k climbing and dropping over 2,500m/day, by Lilka for the last 2 days. We camped and ecologized as we went. The country was quite spectacular in fact quite scary mountaineering sometimes but the horses were like mountain goats and never worried, unlike the humans who often had to shut their eyes! We found some lovely spots for lunches of tomatoes cheeses and fresh bagettes, and a final night in a welcoming hostel with a great dinner, bed, breakfast and hay and as much food as one liked for the horses… we were all very well pleased and hope to make it an annual trip if we can persuade others to come along with us, perhaps some who have been to our workshops? 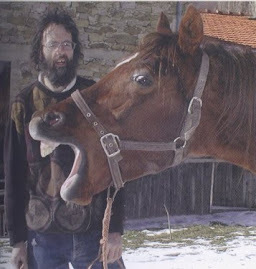 We have had various people wanting to come on workshops of various kinds, including working horses on the land, young horses, and those running horse therapy centres, and have mainly been writing up research articles which are now available on the internet site (eco-etho-recherche.com). Another development has been the purchase of a piece of land in South Devon UK, where the grass grows. It is mainly for Oberlix to have a belly full every year, but we are developing it as a small ecological farm, Pip my son is already starting a market garden and wood workshop, and we will be available from time to time to run workshops in the UK from there. 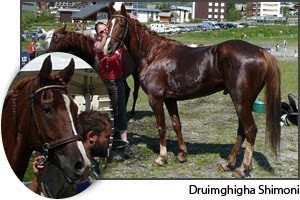 * Druimghigha Lan Yu (Lilka x Oberlix) pure bred arab, 15.1 ( 152cm) mare, 2 years. Being backed. * Lilka (Lillifee x Eldon) pure bred arab, 15hh 9 150cm) mare (11 yrs), competing in endurance this year, marathon & working at medium dressage, beautiful & lovely paces. A real champion.